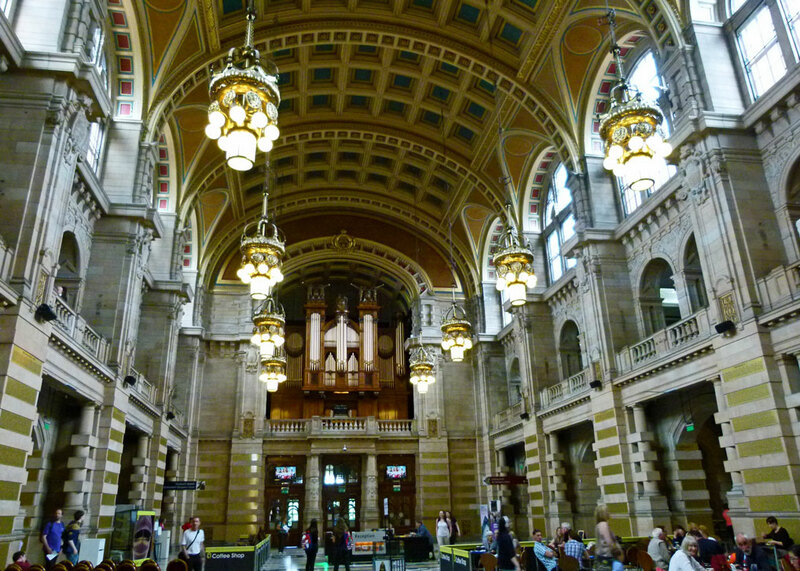 Kelvingrove Art Gallery and Museum comes under the heading, ‘Not to be missed in Glasgow’. 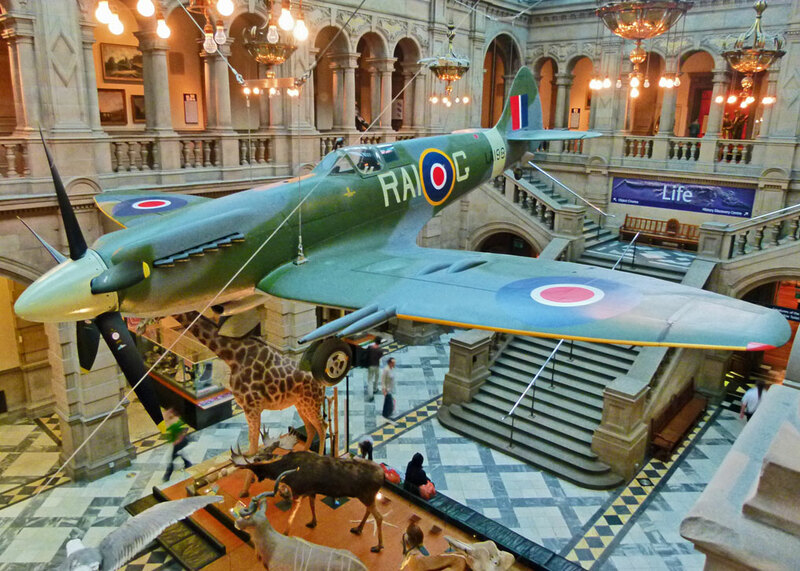 A Spitfire rubs shoulders (or undercarriage/trunk) with Sir Roger the elephant; there’s a stuffed eagle (and other animals), lumps of rock (aka ‘geology’), ancient Egyptian coffins, suits of armour, guns, Charles Rennie Mackintosh bits, fearsome dinosaurs – and loads and loads of art. So far as artwork is concerned, you do not require a PhD in Pretension to appreciate most of the collection at Kelvingrove. I didn’t spot a single unmade bed or dissected body. There is plenty of beautiful art that even philistines like me can appreciate. 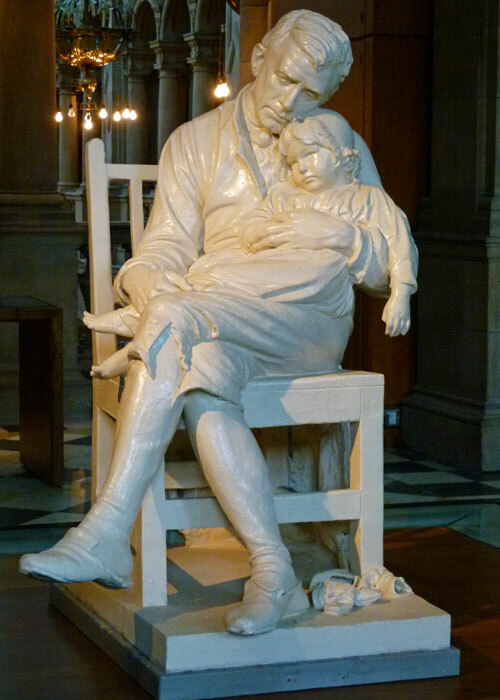 There are wonderful sculptures, like ‘Motherless’ (George Anderson Lawson 1832 -1904), an incredibly moving depiction of a father sitting in a chair cradling his child. 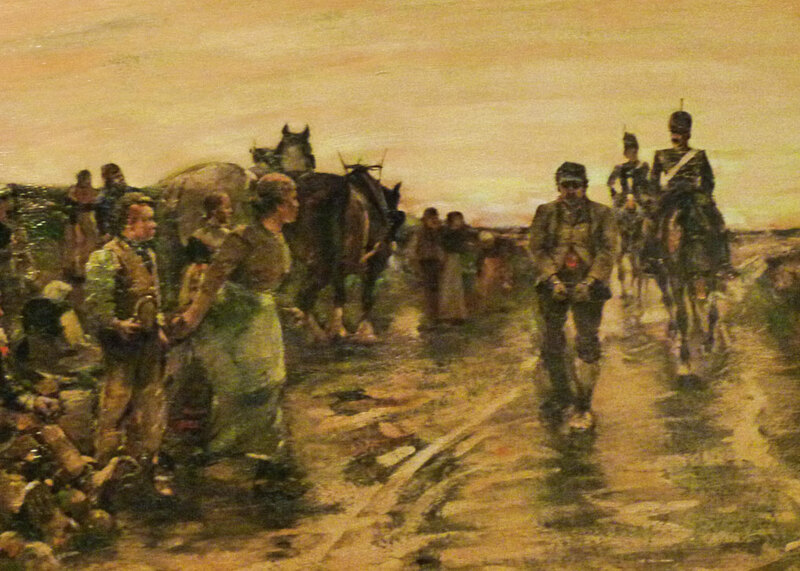 There are paintings by Monet, Renoir and the ‘Glasgow Boys’ – brilliant stuff, with stories leaping out of the canvasses. 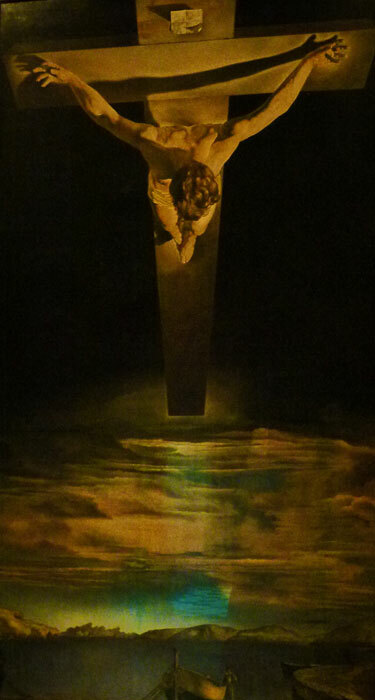 And, perhaps the crowning glory, Dali’s Christ of St John of the Cross, painted in 1951 and controversially purchased by the City of Glasgow, thanks to the Director of Glasgow Museums at the time, Tom Honeyman. The building itself is a late Victorian Gothic wedding-cake structure in pink-red sandstone: remarkable enough on the outside, but Kelvingrove’s interior is quite breathtaking. It has been described by other, far better qualified people, as ‘Spanish Baroque.’ Well, I found it just astonishing, with lovely stone balustrades and little fancy bits of architectural frippery all over the place. There’s a massive organ at one end too – recitals are a frequent occurrence and it is an experience to have this music wash over you as you wander around. You might hear, by the way, that the museum was built the wrong way round and that the architect leapt from one of the towers in despair as a result. 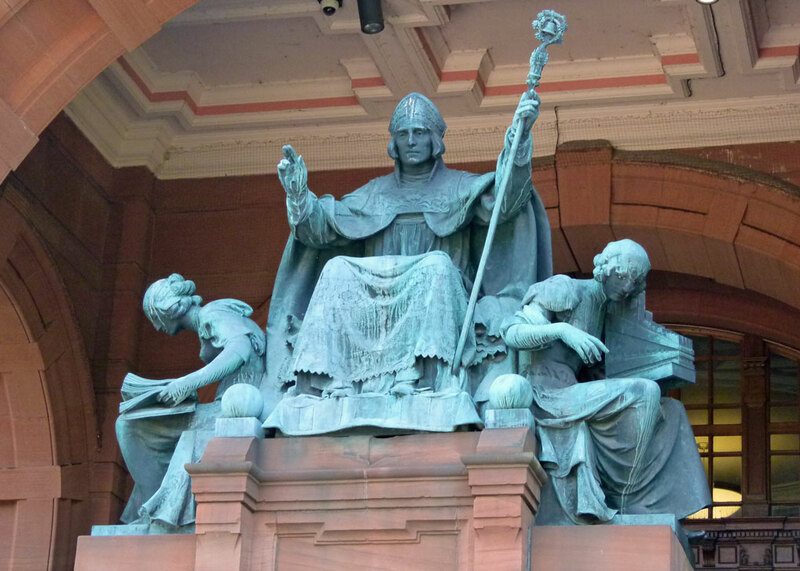 Apparently, this is an urban myth: the main entrance was always intended to be from Kelvingrove Park, where there is a statue of St Kentigern (St Mungo) – considered to be the founder of Glasgow – but most folk come at it from the back door on Argyle Street. And the Spitfire? – this is a Mark 21, built in 1944, in service with 602 (City of Glasgow) Squadron from 1947 to 1949. As usual, hover your cursor over the images for some sort of explanation to appear (unfortunately, this does not work with some mobile devices). 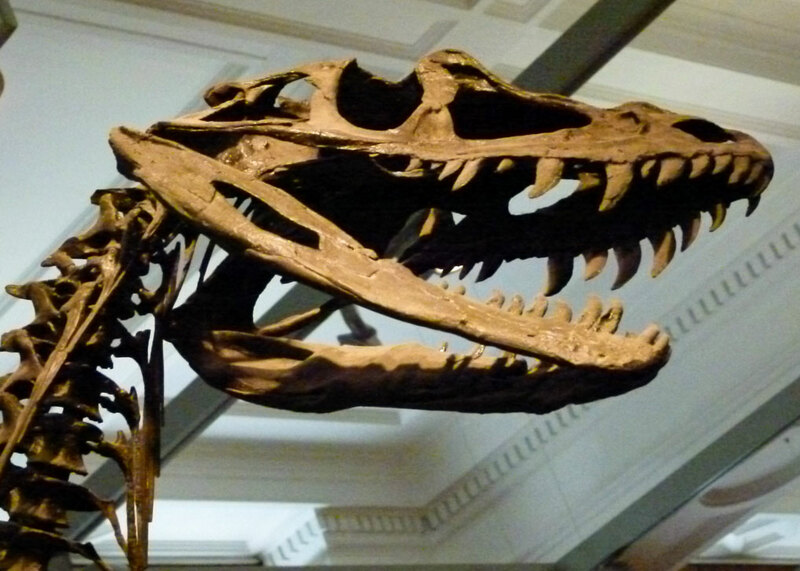 Kelvingrove and other Glasgow attractions will be found in the Attraction Directory. Amazing and intriguing and gorgeous! Thank you for taking the time to add the hovery labels (not sure what they are called) – very much appreciated! Enjoyed a couple of hours there a few years ago. Struck me as the most eclectic museum I’d ever been in. Particularly remember those floating heads! I was glad to read they are intended to bring “lightness and humour” rather than being creepy and disturbing! 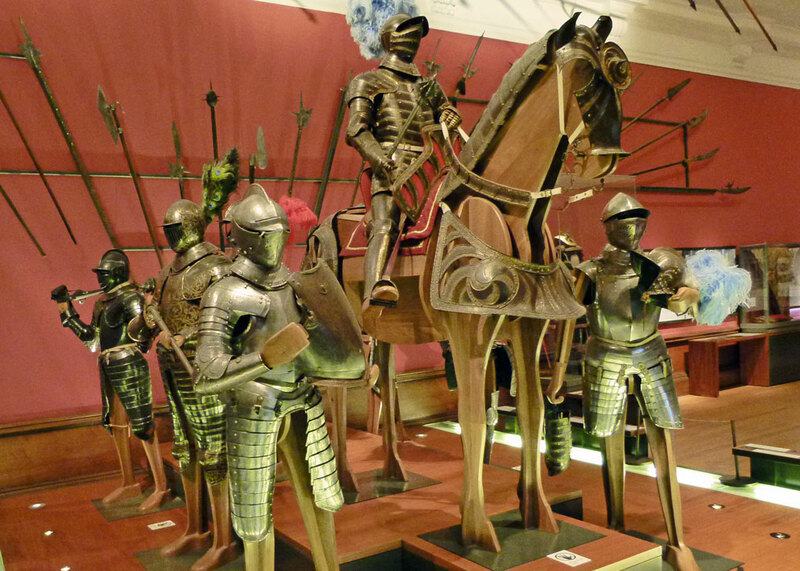 Kelvingrove is on my bucket list. In particular, I saw a photo of Heads some years ago and I’ve wanted to see it ever since. Glad you enjoyed it. it’s the building itself that fascinates me these days and the range of different styles and carvings on its exterior, built at a time when the UK was discovering the wonders of the Indian Subcontinent which is reflected in the Architecture of the Museum and the sculptures in the surrounding park lands. Viewed from a distance from any direction within the park it could easily be temple spires in more exotic climes rising above the jungle. Good point – I should have mentioned the surroundings. If ever I find myself in that city I know where I am heading. Brilliant place and a great post. Thanks Mike! That is one of my favourite paintings by Salvador Dali, if you didn’t think he could paint then you only need to view that awsome painting. I know Kelvingrove well, I used to pop in there regularly when I lived and worked in Glasgow – it is a great museum with something for everyone. Dali’s work has always fascinated me – so precise. I was astonished at the range of items in Kelvingrove and it’s certainly the sort of place you can dip into regularly. A marvelous place. I’d enjoy that… and the architecture is outstanding! That really is a remarkable building – Spanish Baroque with Spitfires and stuffed animals – even Dali couldn’t have dreamed it up!